NullSemantics operators always return a new undefined value. They do, however, check certain preconditions. Definition at line 272 of file NullSemantics2.h. 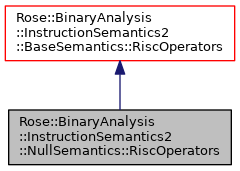 Instantiate a new RiscOperators object and configures it to use semantic values and states that are defaults for NullSemantics. See the virtual constructor, create(), for details. Definition at line 294 of file NullSemantics2.h. Definition at line 299 of file NullSemantics2.h. Definition at line 306 of file NullSemantics2.h. Definition at line 311 of file NullSemantics2.h.